Hello there dear readers! Happy Weekend to you! Have you seen all the "lash growth" mascaras on the market these days? It seems as if every major brand is coming out with one? As someone with sparse, blond, thin, and short lashes, I am always on the lookout for a great mascara! According to the packaging, Revlon's version, Grow Luscious, claims to make lashes thicker and fuller and the "lash enhancing formula complements the natural growth cycle...and improves the overall appearance and condition with each use". Are these claims true? Well, yes and no...you will have to keep reading! I pretty much have a love/hate relationship with this product! I am not one to normally buy into the hype of "lash growth" claims, yet I can't resist giving these products a try! Even if a product only helps a little bit...I need all the help I can get in the area of lashes! 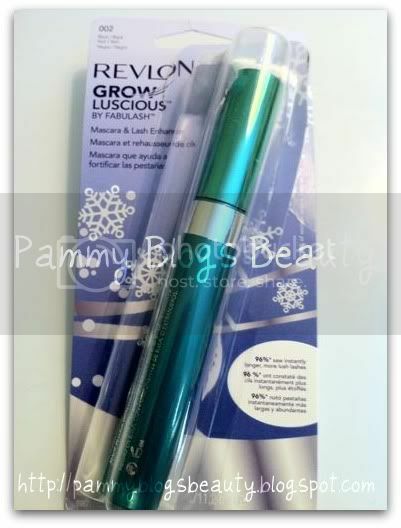 I have tried other "last growth mascaras" in the past (see my Rimmel Lash Accelerator review here) with limited success, but still, I couldn't resist trying Revlon's version as I had heard that it is great! This mascara certainly lives up to its claims as far as lengthening! When I apply this, my lashes look MUCH longer and a bit fuller too. So, you will achieve volume and length. I really like the look of my lashes after I apply this mascara. 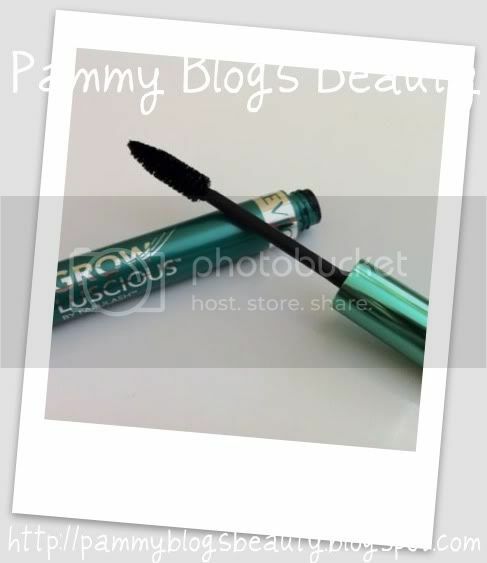 Grow Luscious comes in a very large and sleek metallic green tube. You are getting a great value here for your money with the large tube. I got this in a 2-for-1 package deal at Target for about $9. Not a bad deal for two mascaras! Okay ya'll this wand is HUGE!!! Take a look at the photo below. I used to think that the Cover Girl Lash Blast Fusion, my HG mascara, had a huge wand until I compared it to Revlon's Grow Luscious (Check out my CG Lash Blast Fusion review here)! If you are used to using a mascara with a smaller wand, it might take a bit to get used to the feel of applying your mascara with such a large brush head. But, once you get used to it...I think its great! Something about that large brush just makes you "feel" like your lashes are going to get thick and long! LOL, I guess that is the whole idea. You get good separation of lashes with this non-rubberized brush head. The bristles are very dense and are good for getting volume. This is where I will get into my love/hate relationship with this product. Yes, I *totally love* the look and feel of my lashes with this product on! It gives volume and length without being overly spidery. Totally daytime wearable for me...or build it up a bit more for more drama in the evenings. The kicker...this formula smudges like CRAZY on me! I mean total raccoon eyes! I hate that!!! I don't know about everyone else, but most mascaras smudge like crazy on me. I am not sure if it is the shape of my eye or my eye creams or what. But, it is a major pain. The *only* mascara that does not smudge under my eyes is Cover Girl's Lash Blast range, hence the HG status of Lash Blast Fusion. As much as I love the look that the Revlon Grow Luscious gives my lashes, it is not worth it to me to have it smudged under my eyes within an hour. I painstakingly apply concealer every day to cover my under eye circles, so mascara smudges totally undo all my careful concealing when I try to wipe off the smudges. So, does this mascara "compliment the natural growth cycle" and make your lashes grow better/faster/thicker? Honestly, I don't think there was that much of a difference. My lashes are naturally a bit sparse. When I started wearing this mascara, I did have a particularly sparse area. I tested this product for one month (I know, I am dedicated! Even with the smudging, I wanted to test it out for awhile to see if I could get some growth benefits. Side note: As the formula "dries out" a bit more, the smudging did seem to get a bit better). My lashes do "seem" to be in a bit better condition, but is it coincidence? Possibly. I bet that sparse area would have grown in either way within a month's time. But, possibly my lashes are in better condition overall. Your lashes do go through natural growth cycles where they grow and then shed. So, I think that my lashes are just growing the same way as they always have. No, definitely not, this is a fail product for me. :( I really do wish this product worked for me. But, I just can't deal with the crazy Raccoon smudging that happens under my eyes. If you are one of those lucky ladies that doesn't seem to have this problem, then this might be an amazing mascara for you!!! It really does make your lashes look lengthened and thickened. Its the smudging that makes this a fail for me! 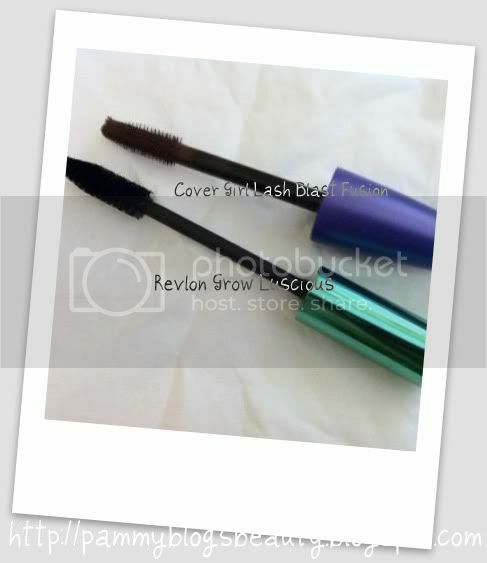 I will be sticking with my Cover Girl Lash Blast Fusion for now. Thanks for reading!!! What are your HG mascaras? I hate it when you find a product you really like then it has one big fault which means you can't use it! Having said that, I might give this a try as I don't usually have a problem with mascaras smudging on me. Diorshow Extase + L'oreal lash serum + Diorshow primer = Holy Grail!! @froggistyle73-Thanks!!! LOL, I just picked up the WnW one too!!! I will review that in a few weeks! Yes, the growth mascaras are hard to resisit!!! @drea-Thanks for sharing your HG mascara formula!!! I only use mascara's with large wands - I love them! And I tried out this mascara because of it's wand. I see no improvement on my natural lashes, but they do seem more conditioned. I believe formulas that are created to condition the lashes tend to smudge after wearing them for too long. If you plan on wearing this mascara all day, take a mini container of cotton swabs, because you'll need to clean up the black smudging half way through the day! @Krystal-Good idea on the cotton swabs! Yes, I bet your right...the conditioners in it probably cause more smudging. I've recently started having more and more trouble with smudging and flaking mascaras. Thanks for saving me some money on this one! Hey Tracy! Thanks for the tip with the waterproof mascara. I havent tried waterproof in awhile as it can get flaky, but might give it another go. But, generally I do top lashes only. Hey Sher! I think I need to try Bad Gal! :) But, I would rather love an inexpensive mascara as I toss them very frequently. I think Falsies will be the next one that I try. Thanks for the tips!!! Hi Emily, No-I don't have the waterproof formula. Generally, I prefer the feel of non-waterproof formulas, but it certainly is probable that the waterproof formula wears better. And, generally I have trouble with *many* mascaras smudging even those that don't smudge on others. My eyes might just be super sensitive/watery and cause mascaras to smudge? It's funny you feel the same way as me on the product -- I keep seeing these rave reviews and I don't get it. The mascara didn't do a whole lot for my lashes, but I really couldn't stand the brush. I have small eyes and it was just annoying, constantly kept poking myself. The thing about the growth vitamins in mascara is that most of them now have Vitamin E, etc. which will condition the hairs and put them in better condition. It's really just a gimmick. I've gotten healthier lashes from wearing mascara everyday for the past few years.